That Samuel Langhorne Clemens is better known as Mark Twain. Elliot begins to write to Madeleine, the Girl-in-the-World – a most dangerous thing to do for suspected cracks must be reported and closed. But Elliot's father has disappeared and Madeleine's mother is sick. 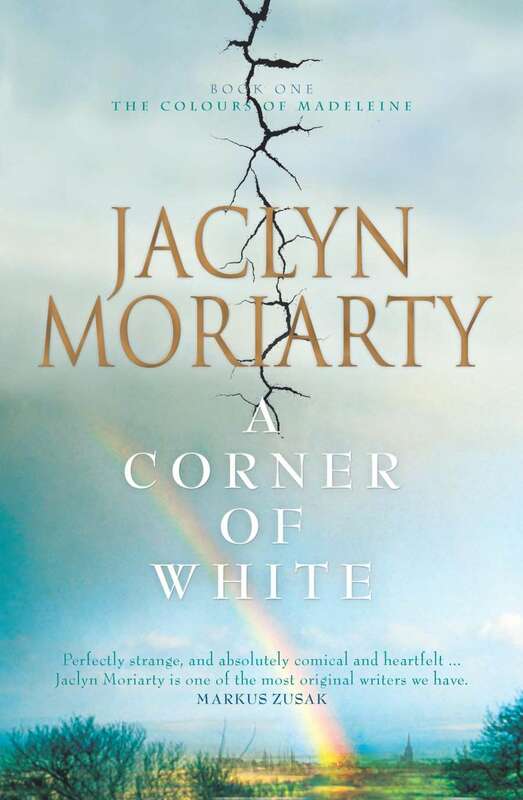 I must confess before I begin to talk about how much I love this book that I am a big fan of Jaclyn Moriarty and her sister Liane Moriarty. In fact if I could wish for who I would have at my ultimate children’s literature conference, these two would be right up there. Liane has written more for adults, but they both have such unique, quirky and humourous voices in their writing, that I would like to hear them both speak about the how’s and whys of their writing. Anyway, enough rambling…the book. In some ways this book reminds me of the book, Daughter of Smoke and Bone that I read earlier. Not just because of the of two worlds existing side by side, but mostly because of the humour and intelligence in the writing. The book is set in two places, Cambridge, England and Bonfire, Cello. In Cambridge Maddie is starting a new life with her mother and is trying to adjust to a life without money. Elliot, is a teenage boy dealing with the everyday teenage boy things, but he is also searching for his missing father, who most people presume is dead. Maddie and Elliot communicate via letters placed in a specific location in their respective towns. Elliot knows of The World that Maddie lives in, but there has been no contact with them for hundreds of years. Maddie does not believe for one minute that Cello exists, and just believes that Elliot has made it up and weaves incredible stories about it. Cello is much like our world, they have similar technology, although computers are still rare. Kids go to school, college, hang out, do stupid things and are pretty much like teenagers anywhere. The things that make Cello different are the seasons, they come and go like weather. Summer may last for only three days, and there was once a winter that lasted a year. The one dangerous thing they have there is Colour. In Cello Colour is a thing, and Colours will attack, in different ways. If a red attacks it will make the people in town, enthusiastic and passionate about things, jobs get done, feelings get let out, and fights occur. If a Yellow attacks it could leave you blind. Throughout the course of the story, Maddie and her friends Jack and Belle are researching a famous person who once lived in Cambridge. Maddie has been given Isaac Newton, and it’s her research in to his life, and his work with light and colour that form a real link between the two characters. I like this book for so many reasons. It’s quirky, funny and intelligent. It’s the kind of book that made me start researching Isaac Newton myself, and wanting to understand light and colour better. It also made me think about the possibility of parallel universes, and how amazing it would be to find a letter poking up from a parking meter, and all of a sudden your life is changed. The story is easy to read and follow, but there’s a lot going on, and I can’t say too much without giving it all away. It’s the kind of book that you want to go into and just enjoy, without having someone like me spoil it by telling you the best bits.